CarGurus has 2,640 nationwide NX 200t listings starting at $18,998. Lexus may be late to the luxury compact crossover game, but it has been picking up speed since introducing the NX 200t for the 2015 model year. The NX 200t is not only one of Lexus’ best-selling models, but it ranks near the top of all luxury compact crossover sales. 2017 sees Lexus make some minor changes to keep the NX 200t looking fresh for prospective buyers. The 2017 NX 200t’s bold exterior design features sharp creases, triangular head- and taillights, flared fenders, and a big grille that help it stand out from the crowd. You can outfit the NX 200t even further with the F-Sport package, which adds an aggressive-looking body kit—a larger mesh grille, new bumpers, side sills, and a set of 18-inch alloy wheels. The F-Sport package also offers two new exterior colors: Ultrasonic Blue Mica 2.0 and Molten Pearl. The NX 200t’s interior is a little less radical, but it does feature some key Lexus hallmarks—namely, an impressive build quality and premium materials. Climate controls are mounted high on the center stack to provide easy access for both the driver and front passenger. The Lexus Display Audio infotainment system is controlled via a knob and now comes with Scout GPS Link, which syncs your smartphone with the vehicle to provide navigation. An optional Navigation package adds a Remote Touch touchpad controller and Lexus Enform. The seats in the NX 200t come upholstered in Lexus’ faux leather NuLuxe, with real leather an available upgrade. Those sitting up front get power adjustments (10-way for the driver, 8-way for the passenger) and optional heating and ventilation, and adding the F-Sport package gets you a set of bolstered sport seats. Rear passengers receive decent head- and legroom and reclining seats. The NX 200t does disappoint, however, with its minimal cargo space—with the rear seats up, it offers just 17.7 cubic feet, making it somewhat smaller than the average subcompact crossover. Folding the rear seats increases cargo room to 54.6 cubic feet, which still trails competitors. The NX 200t features Lexus’ first turbocharged gas engine—a 2.0-liter 4-cylinder paired with a 6-speed automatic transmission that’s good for 235 hp and 258 lb-ft of torque. With front-wheel drive (FWD), the NX 200t can reach 60 mph in 7.2 seconds, and with all-wheel drive (AWD), in 7 seconds. Fuel-economy figures stand at 22 mpg city, 28 highway, and 25 combined with FWD; 22, 28, and 24 with AWD; and 22, 27, and 24 with AWD and the added F-Sport package. If you decide to go for the F-Sport, you’ll be happy to know it isn’t just an appearance package—it adds a set of summer or all-season tires, a sport-tuned suspension, a turbo boost gauge and g-meter, and Active Sound Control, which pipes engine sounds into the cabin via speakers. When it comes to safety, the NX 200t performs well for its class. The National Highway Traffic Safety Administration (NHTSA) awarded the 2017 NX 200t a 5-star overall rating, while the Insurance Institute for Highway Safety (IIHS) named it a Top Safety Pick+. 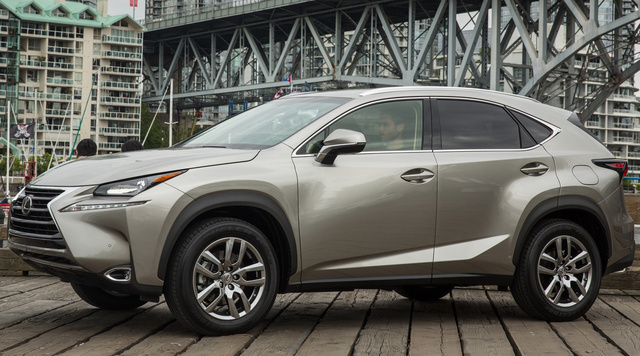 The NX 200t comes equipped with a full set of airbags, antilock brakes (ABS) with brake assist, traction and stability control, a reversing camera, and Lexus Enform Safety Connect, which provides automatic crash notification, emergency assist, a stolen-vehicle locator, and roadside assistance. Optional features include blind-spot monitoring with rear cross-traffic alert, lane-departure warning, adaptive cruise control, and a collision-mitigation system. The 2017 Lexus NX 200t starts at $35,085 for the FWD version, and adding the F-Sport package brings it to $37,185. AWD is available for an extra $1,400. What's your take on the 2017 Lexus NX 200t? Bohol Heather, if Lexus is 'just another Toyota' to you, you're driving the wrong car. GuruZ652G pI just bought one and can't believe how bad the gas milage is! I get approximately 13 in the city and 20 on the highway. some design flaws - no head room, sun visors do not block anything - too small, when you want to search for a station, you actually need to play with the knob! no button on the steering wheel to just browse through stations - disappointing you have to "set" stations! Overall, not impressed and sad I made the decision. I miss my RX350 and will go back to that after this lease is up. Anthony I get better gas mileage than what you are seeing. Are you burning premium gas? I enjoy my NX but I had a RX330 before so different frame of reference. Have you driven a 2017 Lexus NX 200t? I have a 2017 lexus nx200t my inspection is up and maintenance light is on, I have 20700 miles. How much do you think they will charge me? Car runs good, no issues besides patch job on two tires.